This week we are sharing Nelson’s story about his second time around as a pawrent. After adopting his first pup through Wags and Walks, he knew he was destined to give another pup a furever home. Why adopt one when you can adopt two? You won’t want to miss out on this heartwarming story about the bond that Nelson shares with his newest furry friend Pop Tart and the bond that the two pups share. I adopted my first dog, Jack, back in 2013 from Wags & Walks. He completely changed my life and I think we're both so appreciative every day that we have each other in our lives. While Jack gets plenty of exercise (tons of walks and hikes) and plays with so many dogs in our neighborhood, a part of me really wanted a little buddy for Jack. I thought a good solution would be to start fostering another dog -- that way Jack would have new friends come through and we could also help out other dogs. I remember going to the Wags office and them bringing out this tiny little dog and they said his name was Pop Tart. I honestly would've never picked out Pop Tart if it was up to me -- and boy was it a blessing that it wasn't up to me. He's fun, funny, curious, and really sweet. It's a little strange to think of a dog as "funny" but many people have described him that way! He just does his own thing and always has a good time. He really loves life. He and Jack also get along real well. They have epic wrestling matches daily! How did you find out about Wags and Walks? I had always wanted a dog and just one day, I decided to take baby steps towards one. I somehow found Wags and Walks' website and started looking at the available dogs. 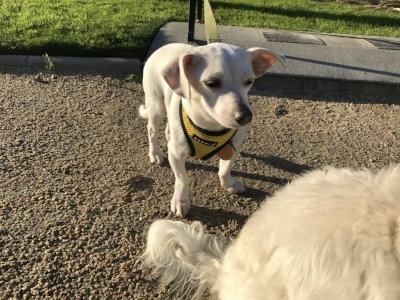 Then Wags was doing an event at the Brentwood Country Mart, then I saw this incredibly cute and sweet dog (Jack), and then that Saturday, one thing led to another and next thing I knew, I was at Petco frantically trying to figure out what a new dog needed! When you foster a dog, there are occasional meet ups with prospective adopters, but there are also adoption events. I took Pop Tart to one adoption event and basically suffered a panic attack. Pop Tart was sad and unhappy and I was melting down. It wasn't long after that I adopted Pop Tart. Pop Tart was and is a puppy so house training was challenging. It was a little challenging with Jack too, so that helped prepare me. It took trial and error, effort, patience, good guidance from a wonderful trainer I know, and time -- but we got through it. As for quirks, Pop Tart can also suss out food like nobody's business. Also, he growls at soccer balls and garden gnomes. It's hard to describe how fully things changed for me when I got my first (and then second) dog. They're just my buddies. We hang out all the time. We talk all the time. I plan my day around them. I suppose on a specific level there are things like I exercise a lot more (because of all the walks), I'm much more social (you won't believe how many people we've met over time that I would've never talked to, but did because we're constantly meeting other dogs), and I've made so many wonderful friends who are also dog lovers. But the best thing, of course, is having two great great friends and that's a beautiful thing. If you're reading this and thinking of adopting a dog, do it! It might be the best thing that ever happens to you. Older PostJoin us at our Howliday Bazaar!